Jio tv for pc online is a mobile application from which you can enjoy 350+ HD channels live for free, only JIO users can use this service on their smartphone but now JIO has announced the web version of the application by which you can now watch all the movies and live shows in your Big screen so we are here to provide you Jio tv for pc download in this article. When JIO was giving free mobile data at the beginning all the other telecommunications companies had to suffer huge lose and customers were happy to enjoy the data at much cheaper and affordable rate, now it is time for DTH service providers. The web version JioTV has a similar interface as the JioTV mobile application, it is very much responsive and there are lots of HD channels so that clarity will be excellent when you watch it Tv or Computer. To watch all this channel, you will need a Jio Sim and that’s all, you will have to log in from your JIO mobile number and you can enjoy this service as long as you have your mobile number recharged. The Web version of jioTv supports all the well-known languages from English, Punjabi, Urdu, Tamil, Hindi, Gujarati and many more. Along with 550 Tv channels users can watch live content from anywhere in their computer or JioTv application and you won’t have to break the bank to recharge for other applications to watch Live Tv for PC, and that’s the best thing we liked about this application you pay only the recharge amount and you get, data pack along with free JIO services which you can access from your home WIFI also so that you don’t run out of Data. 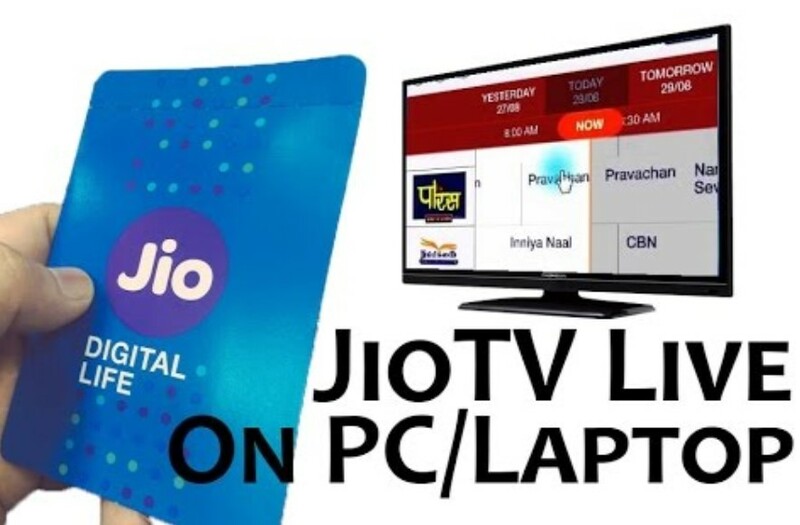 There are several ways by which you can use the JioTV on your laptop or PC, we have listed down three different methods with step by step guide. You can login with your JIO number or Jio ID and password. If you do not have Jio number need not worry because you can ask your friends for their ID and Pass, this application does not have maximum user limitations multiple users can login together and view the content for absolutely no fees. A very popular and well-known android emulator for PC is very useful to run an android application on a windows computer it is just like having an own tablet inside a windows computer, it’s very smooth and responsive. This method is only recommended by us if you have trouble accessing the Web version of the JioTV. Jio TV for PC Download steps available below. After downloading the blue stacks application, install it onto your computer. Choose the option to install the play store if popped up. Sign-in using your google account. Download Jio Tv for laptop application. Open the JioTV and sign-in using mobile number or JIO iD and password. Done! Now you can enjoy watching JioTV on your computer. Tip: press F11 to enter into full-screen mode. Another way to use JioTV is by installing the Jio Application to your Android Tv Box, by this way you won’t have to pay other applications for monthly or yearly subscription and you can enjoy your Wonderful HD viewing experience. Download the JioTV application from browser. Transfer it to your Android Box. Install the JioTV in Android Box.